James Franco has backed Hillary Clinton for president in what may be one of the year’s most surreal endorsement videos yet. 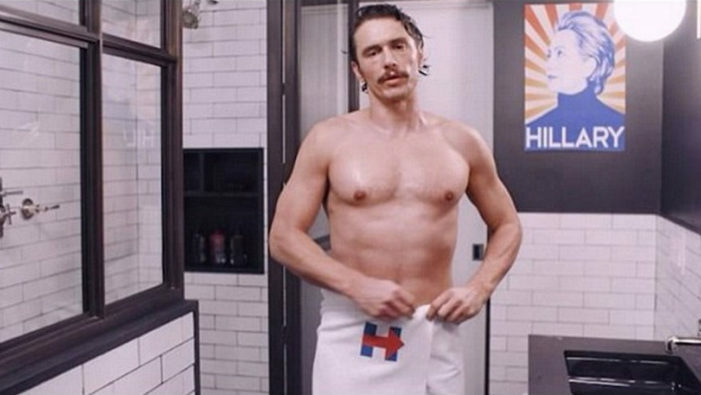 The outspoken actor strips to an ‘I’m With Her’ towel while reeling off a list of not-quite-true accomplishments of Clinton’s as he offers his endorsement. “I don’t always endorse candidates. But when I do, they’re extraordinary,” he says. Of course, it’s not really any surprise that Franco prefers Clinton to Trump, not least because of his vocal support of the LGBT community over the years. Just one month ago, Franco shared another video titled “Introducing the Most Interesting Woman in the World”, explaining why Clinton is the best candidate for the U.S. presidency.